Digital Citizenship is a concept which helps teachers, technology leaders and parents to understand what students, children, technology users should know to use technology appropriately. You will be challenged to take perspective on the opportunities and potential pitfalls of the digital world. 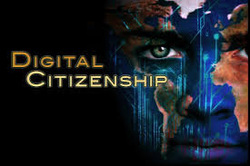 The following lessons will use rich discussions and ethical debates to cover the digital literacy and citizenship topics including relationships, identity, respect, and privacy. Furthermore, the lessons highlight how teens can be mindful when curating their digital footprints and how they can take ownership of their digital roles by using today’s technologies to create, publish, and share their own creative work.